A unique tool for professional consultants, coaches and trainers – or individuals – who work with VALUES. Even if you are a relative novice! The VALUE cards come with an invaluable handbook with background basics on values and ideas on how to use the cards. 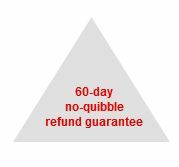 We also give an open offer to discuss ways of using the cards.You can easily have them with you wherever you go because they’re small, light and protected – and covers those times when values come up out of the blue.Finally there is no financial risk whatsoever, because of our 60-day no-quibble refund guarantee. CLICK HERE and buy some value cards for yourself!